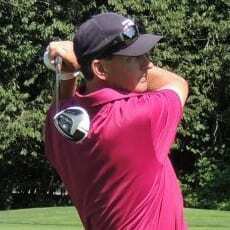 Seymour Creek’s Lead Teaching Professional Bryn Parry proved again that he is one very tough man to beat on any day, shooting an impressive round of 66 (-6) at the always challenging Richmond Country Club. 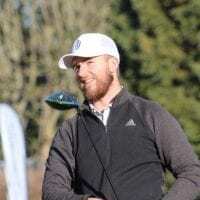 Not only did Parry win convincingly by 3 shots (over Kendal Yonomoto), but he made it 2 consecutive wins at the Richmond Country Club in as many VGT events played there (winning the Hadassah Wizo Charity Pro-am back in July). 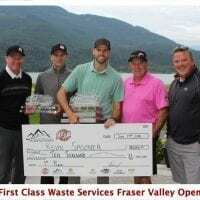 After missing out on playing the Golden Ears Open (For good reason, as he was playing the RBC CANADIAN OPEN), Parry missed out on the opportunity to pick up some valuable CLEVELAND/SRIXON (VGT) ORDER OF MERIT Points at the Golden Ears. And with Ryan Williams on his heels coming 2nd place at the Golden Ears to Kevin Stinson, Parry was in the hot seat to keep the pedal down and keep the margin a healthy one with only a couple of events remaining on the VGT schedule. And with his win he did just that. 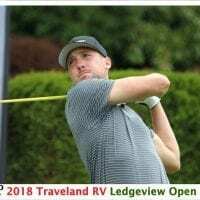 Parry rattled off 5 birdies and an eagle on 18 (for the skin) to offset one bogey en route to his 3rd straight win on the Vancouver Golf Tour! The 1,500 points he collected puts him a comfortable lead on the CLEVELAND/SRIXON Order of merit, 2,700 points ahead of 2nd place Nick Taylor and 3,600 points ahead of 3rd place Ryan Williams. This year’s Order of Merit winner at the end of the WOODLAND GOLF VGT TOUR CHAMPIONSHIP will take home a $2,500 Order of Merit Bonus to go towards the Q-School of their choice! VGT will pay out another $5,000 in year-end player awards, including $2,500 in Player Bonuses to CLEVELAND/SRIXON Team players, a $1,500 Most Improved Player Award sponsored by PAINE EDMONDS LAWYERS and a $1,000 Rookie of the Year Award Presented by MARKETPLACE IGA! Dave Wood – Richmond Country Club GM (Continued thanks for the support of the 2 Pro-am events on our schedule. Please pass on our sincere thanks to your members for supporting this great event. 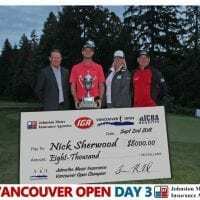 Your members should be very proud of your golf course shining so brightly for 2 of the most successful Pro-ams in BC!!). Final thanks to the tireless work of all the Flora Aasen Committee members (John, Reg, Sal & team) who continue to raise serious funds for the Alzheimer’s Society of BC. Congratulations to all of you for doing such great work for the Charity the past 12 years, raising over $400,000 to fund research, support, education and advocacy services for the Charity!